AGHP Geohazards Profile: Todd Hansen, Yeh and Associates, Inc.
AGHP Member Todd Hansen works out of Denver, Colorado for Yeh and Associates, a full-service engineering and construction management company that is involved in several different geohazard-related fields. Key sectors of his work include landslide and rockfall applications. Part of the company’s success, Hansen notes, is rooted in the extensive experience its company leadership has from careers working within major agencies, such as FHWA, CDOT, and Caltrans. Though he adds a lot of levity to his discussion of his work and spends a lot of time recognizing the professional contributions of others, Todd Hansen is a very involved and serious advocate for safety in the geohazards field. Hansen takes full advantage of having so many experienced engineers and technical experts available to him throughout Yeh’s workforce. He regularly calls colleagues to gauge their thoughts and to hear of project and solution examples that his company peers had used in their previous professional roles. These interactions allow him to expand his own expertise and understanding while keeping relationships and a culture of recognition strong within his immediate office and between Yeh’s other locations. Though the company has grown significantly, it retains the same “family feel” that Hansen recalls from his earliest days with the firm. “I see a determination to keep that camaraderie and cooperation throughout the company,” he says. One of seeds for Hansen’s future career was planted in childhood. He visited Mt. St. Helens. Visits like this, images he saw of the destruction from that volcano’s eruption, and stories he heard from loggers (including those who lost friends in the blast) captivated him. That wonder and a steady presence of the timber industry in his early life guided him. He ran survey tape through blackberries and thorns. He helped lay out roads with logging engineers and burned off timber slash piles. “Blasting road cuts with a bunch of half-deaf loggers was a lot of fun,” he says. In summers, he took up fighting wildfires to pay for school. “I thought nothing could beat being a professional arsonist,” he says. Bob Watters at the Mackay School of Mines provided the next big change for Hansen. Watters introduced him to the geohazards industry—a field in which Hansen could get paid “to destroy things” (while making everyone safer). One of the field’s problems, he says, is that the general public has almost no awareness of the scale on which geohazards professionals work and all the beneficial impact their efforts have on infrastructure and community safety. Only a few high-profile planned projects might get discussed. Beyond that, the subject of geohazards really only emerges on a larger level when something goes wrong. Hansen shares his expertise with his peers on the AGHP Rope Access Committee. 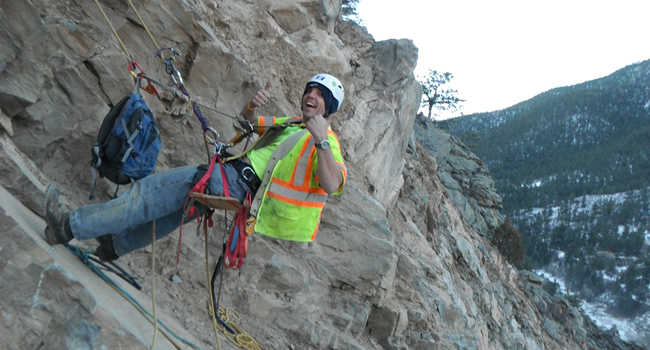 He appeals to other AGHP members to share their experience with rope access issues. The standardization body ANSI, for example, is updating the Z359 code (ANSI/ASSE Z359.1, Safety Requirements for Personal Fall Arrest Systems, Subsystems and Components). AGHP members, Hansen says, need to be involved. To learn more about the Rope Access Committee and other AGHP committees, visit the Committees Page. To learn more about the work of Yeh and Associates, Inc., visit www.yeh-eng.com. 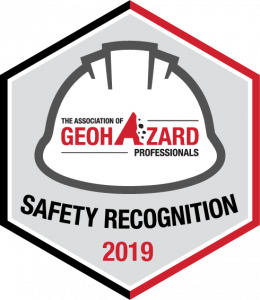 This entry was posted in geohazard, geotechnical engineering, landslides, rockfall, rope access and tagged AGHP Committees, geohazards safety, landslide prevention, Mackay School of Mines, rockfall mitigation, Rope Access, Todd Hansen, Yeh and Associates.